Oddly, since 1814 was known as the “year without a summer” in England, both ladies in October’s fashion plates are wearing sandals with their walking costumes. One hopes that their stockings were thick enough to keep their poor toes warm! 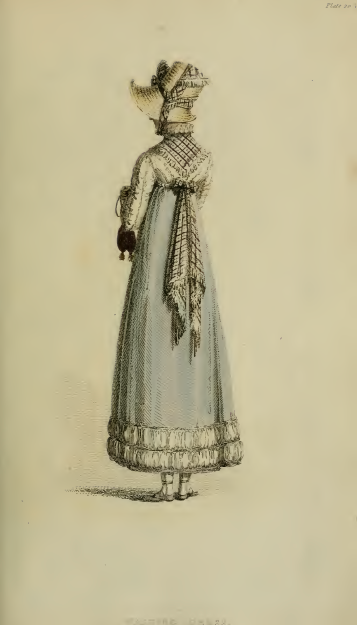 Both dresses also feature handkerchiefs of net used as sashes tied around the bodice, the first “crossed over the bottom and tied in bows behind,” the second “tied in streams and small bows behind.” The handkerchief in Plate 19 almost makes the lady appear to be wearing a bandolier, although nothing else about her appearance evokes a military air. 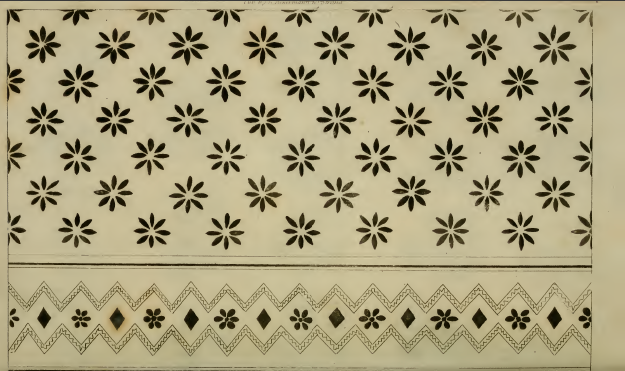 The checks of the handkerchief in Plate 20 give the wearer a countrified air to my eye, although linking checked fabric with the country may be an association that dates to later than the Regency period. As in one of last month’s plates, this month also seems to feature a color mismatch between plate and description. 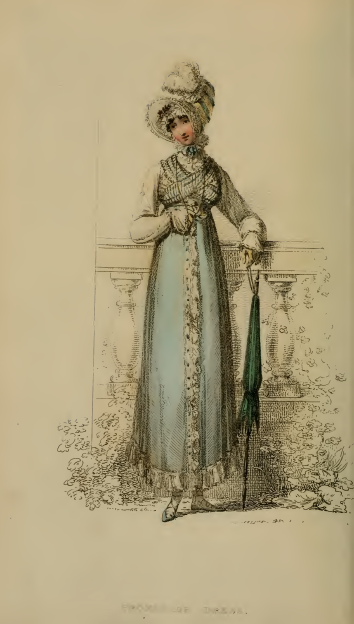 The dress in plate 20 is described as “evening primrose-coloured,” but looks to be almost the same shade of “celestial blue” as the gown in plate 19. 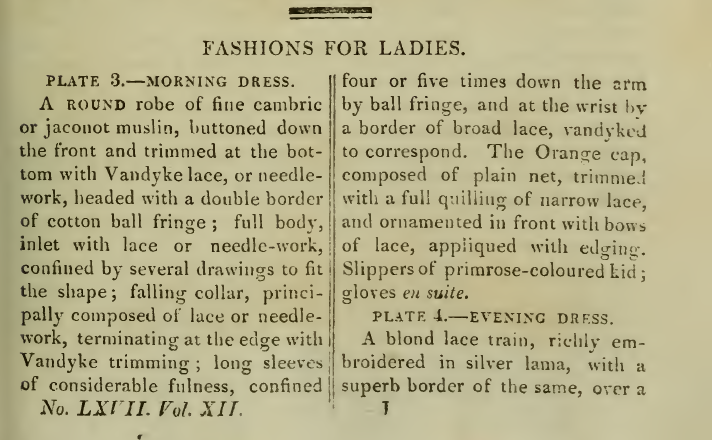 Plate 19 is described as a “Promenade dress,” while plate 20 is labeled “Walking Dress.” I wonder if Regency readers would have know the differences between the two? Flowing elliptically-petaled flowers and leaves are featured in this month’s needle-work pattern, along with small dots along the edge. Smaller floating flowers appear above the main flowers, giving the feel of fall seeds floating in the wind. 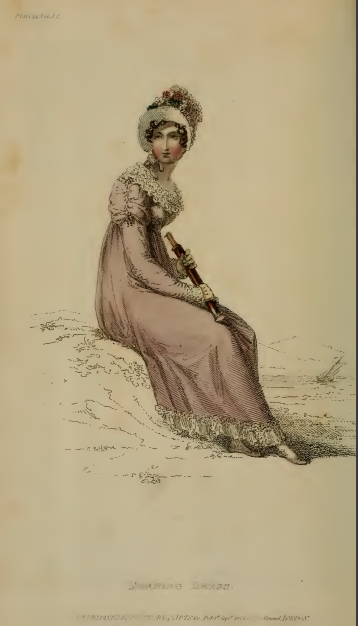 Is the lady in the first of this month’s fashion plates on holiday by the seaside? Or is she the daughter or wife of a naval officer, watching by the shore, hoping to catch sight of the ship that will carry her beloved family member back home? She looks rather disappointed; has she given up looking through the spyglass at the sailing ship in the distance to gaze instead off into the distances of her own imagination? 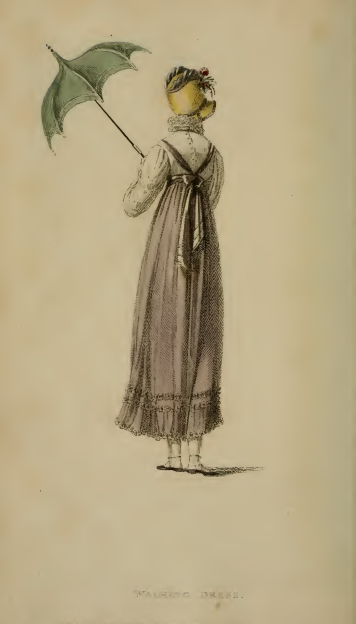 The dress she wears, a round robe of lilac or evening primrose sarsnet, features trimming at both hem and neck of a quilling of blond lace edged with chenille (perhaps to keep the lady warm against September’s cool ocean breezes?). A “French hat” of white and lilac satin keeps the winds from ruffling the lady’s face-framing curls. 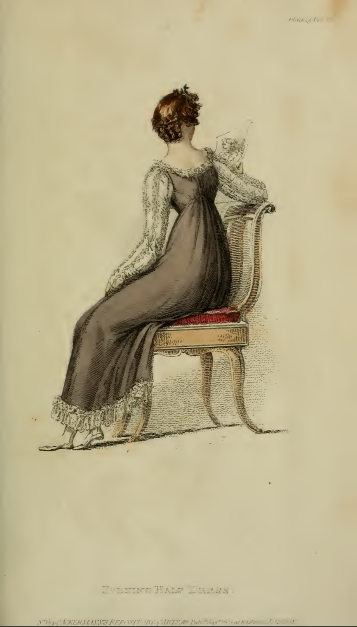 The second plate features an “Evening Half-Dress,” presumably to be worn for an informal evening at home. 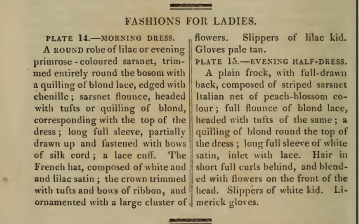 Though the copy describes it as “a plain frock,” its long sleeves (inset with lace) and its full flounce of blond lace at the hem and its quilling of lace around the neckline certainly give it a far less than plain feel. The dress fabric is meant to be “striped sarsnet Italian net of peach-blossom colour,” but the pigment must have discolored; the dress looks more purplish black than pink. 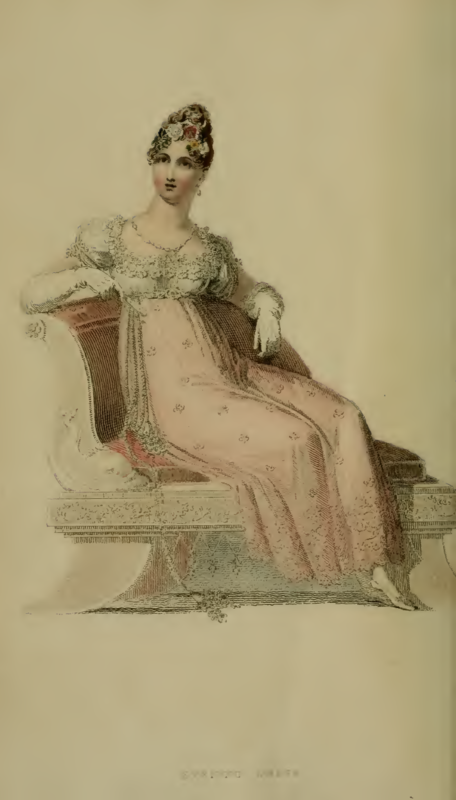 The lady’s position highlights her unusual hair style: short full curls in a row several inches higher than the nape, and curls in rows down he sides of the head, with the crown combed flat and straight. Lots of time spent with the curling iron to achieve that look, no doubt. It’s been several months, now, since Ackermann’s has included its former fabric samples. I’ll continue to reproduce the needle-work patterns in their place. Thistle flowers leaning in one direction, with leaf fronts tilted in the other, echo the feeling of the wind in the first plate, I think. 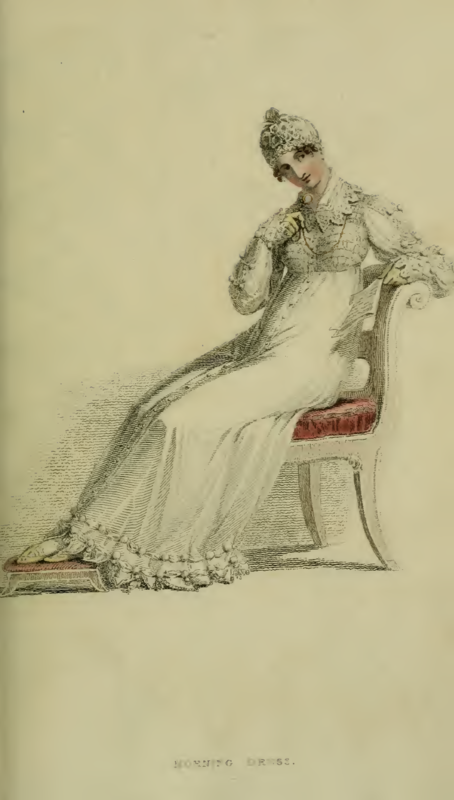 It’s a major faux pax today to be caught wearing socks with sandals, but for ladies in the Regency period, one wouldn’t be caught wearing one without the other. 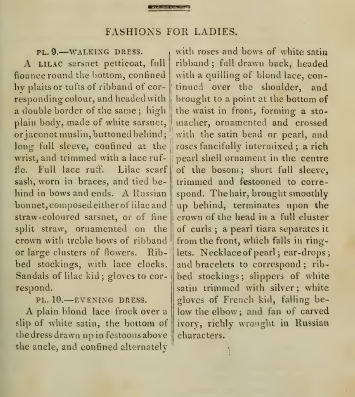 In this month’s first fashion plate, we see a rare example of a lady in sandals, these ones made of lilac kid. You can just make out the tiny straps around the lady’s ankles if you look closely at the plate. The lilac scarf sash,”worn in braces,” also gives this summer outfit a casual air. 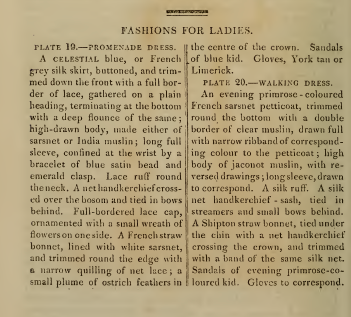 One might think that short sleeves for a summer stroll would be more suited to such an outfit, but long sleeves are called for here, made from sarsnet or muslin. At least the artist has given our lady a parasol to keep off the sun, an accessory not called for in the outfit description. 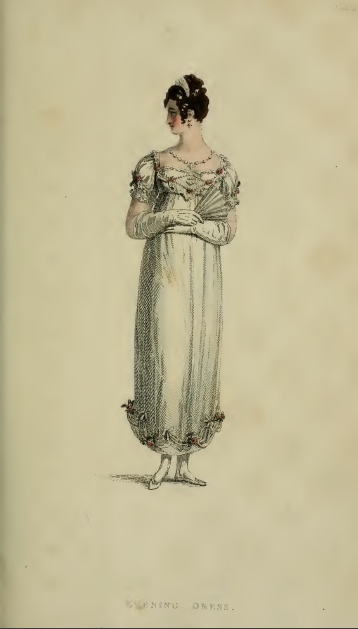 Plate 10, an Evening Dress, has, like this month’s Walking Dress, a fairly high hem line, due in part to it being drawn up in festoons above the ankle, almost like a curtain or drapery. 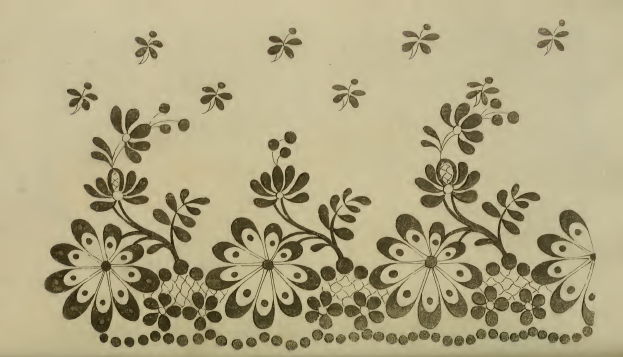 The gown is not only decorated about its hem, but also about its bodice, with “a quilling of blond lace on the back and continuing around over the shoulder to give the look of a stomacher. Beads and roses are “fancifully intermixed” on the bodice itself, outlining a central “pearl shell ornament” fixed in the bodice’s center. A shell native to England? Or one brought home from an exotic traveler to warmer shores? No fabric samples this month, only an embroidery pattern of flowers and zig-zags that would look lovely as the border of a white summer shawl, don’t you think? 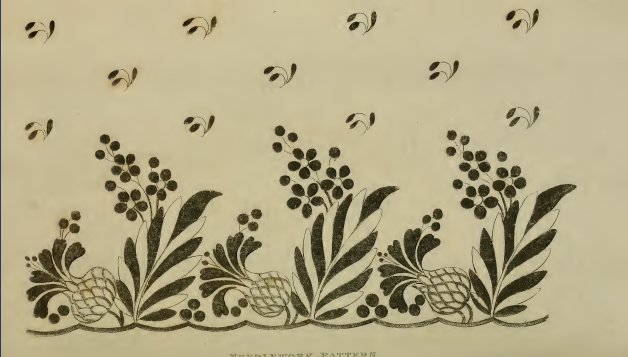 Extravagant trimmings are the order of the month for July 1814’s fashion plates. 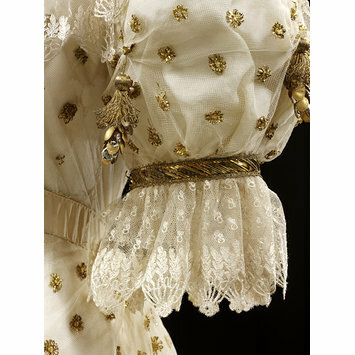 The morning gown on display features Vandyke lace and cotton ball fringe around its hem, as well as abundant lace and needlework around the collar. The cotton ball fringe is also used to confine the full sleeves in four or five places down the arm. 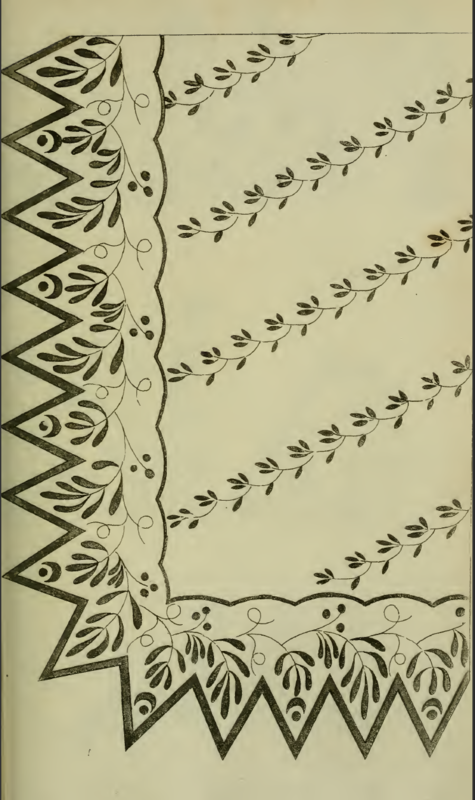 The bodice is described as “full body, inlet lace or needle-work, confined by several drawings to fit the shape”—I’m wondering if “drawings” here refers to “drawing strings,” or whether some other means were used to make the bodice conform to the wearer’s figure. This month’s evening dress begins with the extravagance of “a blond lace train, richly embroidered in silver lama, with a superb border of the same.” It is a bit difficult to see the details of the lace train in the actual print, so I’ve added a shot of a dress in the V&A Museum c. 1820, which features blonde lace as a trim, below the print. This gown features gold, rather than silver, embroidery, but you can imagine a similar effect. The Ackermann’s gown has the additional feature of “rich silver cord, and large bullion tassels, tied on the side in long loops and streamers”—handy for fidgety fingers no doubt, but all too likely to catch on passing furniture, I fear!